On this page I will explain how to filter data with PowerShell’s -Like comparator. One day I wanted to create a WMI script using the network adapter, but even using PowerShell I could not find the right properties, so I went back to basics and listed all the cmdlets containing ‘Adapter’. In a nutshell, if you are thinking, ‘I am probably going to need a wildcard to find this item’, then start with -Like. However, if you are pretty sure of most of the letters in the word that you are looking for, then you are better off experimenting with -Match. Here is a more technical distinction: -Match is a regular expression, whereas -Like is just a wildcard comparison, a subset of -Match. This example only lists those cmdlets that end with the letters ‘adapter’. Note 1: Observe how Get-WmiObject uses the -List parameter. Note 2: Most comparator scripts are introduced with Where-Object, followed by the pipeline construction: $_. The problem with Example 1 is that I suspect there are more cmdlets containing the word Adapter, for instance ‘adapter’ maybe in the middle of the WMI class name. Note 3: Once again, realise the importance of the construction $_. Dollar, underscore. The dot means ‘in this data stream’. Note 4: Thanks to the second *, Example 2 should returns more cmdlets. See more PowerShell -Match examples. I like to be flexible with PowerShell’s comparators, if the results are not as I anticipated then I may try an alternative such as -Match or -Contains. Note 5: Actually this example should list the same WMI classes as Example 2, but in other scripts you may getter better results using -Match instead of -Like. Time for a recap: The simplest comparator is ‘equals’, and the way you code this in PowerShell with -eq (not =). However, in these examples, -eq would not be effective, because realistically you would have to know the answer before you could ask the question! I would like to take this opportunity to examine other comparators. It is surprising how often the negative -NotLike operator produces a neat solution to a scripting problem. For instance, there are several WmiObjects beginning with CIM, one way of excluding them would be to Not Like “CIM*”. Furthermore, by using multiple criteria in the filter, you can fine tune the output, to achieve my goal I have added ‘-And’. If for any reason -And fails remember this, when appending a second comparator the secret is to add another instance of the comparator ($_.name) after the -And. Write-Host `n $WMI.count "WMI objects not contain CIM or __"
Note 6: My mission is always to get you started. Now it’s over to you; experiment with different filters, substitute your ideas for “CIM”, and “__”. Perhaps best of all would be to combine -NotLike and -Like. Note 7: I appended code to count the number of WMI classes, this helps to see which variation of my script returns the most items. These help files introduce a whole world of specific terms, for example, ‘regular expression comparisons’ and ‘wildcard comparison’. Once you need and understand such extra information, then I have succeeded in my mission of introducing you to -Match and -Like. So often we suffer from information overload. 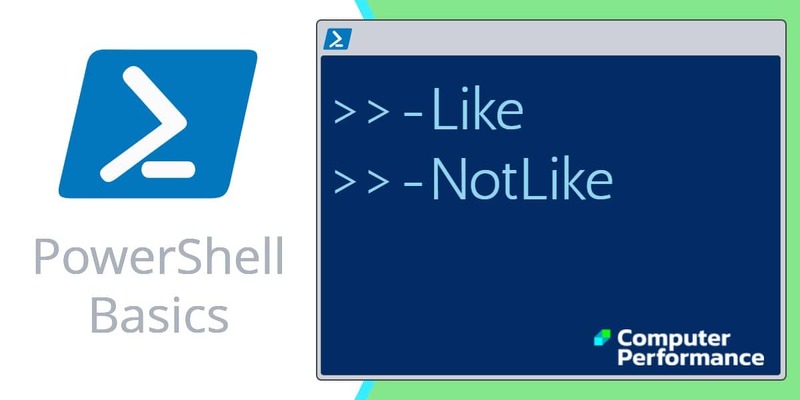 Working with PowerShell is no different, however it does supply three conditional operators to filter your information: -Match, -Like and -Contains. Each operator has different properties; with research, you can get just the filter you need, and thus filter the desired stream of information into your script’s output.